The first of the marathons this season occurred under blue skies and a fresh East Anglian breeze as the Women’s Master C 8+ and two W1x set about to complete the 22km course. Where were all the other men you may ask? Obviously waiting on us ladies, ferrying us around and being our general land crew. A deed not to be sniffed at as 10 very exhausted ladies require substantial assistance! 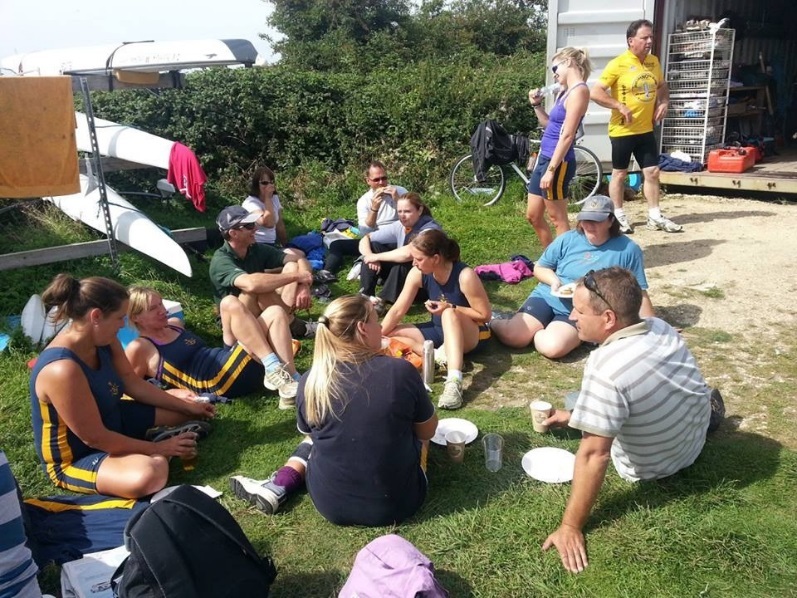 The ladies eight consisting of Emily, Emma, Linda, Gill, Vicky, Kate, Sandra and Jen and coxed by Ian, had two goals in mind – firstly to finish the course, and secondly to attempt to row it under 2 hours. A feat we deemed achievable, yet slightly daunting, but the aim was to maintain at least 3.2m/s for the course. The longest head race attempted by us indomitable ladies so far had been the Head of the River Race on the Thames – a measly 7km. Suze was also attempting a big task, taking on her first ever solo head race at WNov. Starting with a 22km one could be deemed as foolhardy, but with fitness and determination on her side, plus a little bit of insanity, she was up for the challenge. Anna now at WIM2 and with plenty of experience behind her was out to achieve a fast time and set herself a challenge for further races. After a ridiculously early start, leaving the boat club before 6am (apologies to all of Dave’s sisters friends and relatives camping over) we set off full of trepidation for the wilds of East Anglia. Thanks to the sat nav, we found the start at Denver sluice quite easily, but after the gorgeous summer we have had we weren’t really prepared for the 11⁰C weather the fens had to offer. Suze was up first and we waved her off as she confidently headed up stream towards Ely. The ladies eight were off next, supplied with energy drinks, water, first aid kit, flapjacks, gummy sweets (yes Vicky I saw you eating them), chocolate and spare seat. The kitchen sink wouldn’t quite fit. Before even leaving the landing stage, Kate (me) had forgotten all fluid supplies – rapidly corrected by long suffering husband Charlie, and Sandra’s seat had broken. Thankfully due to our over zealousness in bringing everything, the seat was repaired and we were ready for the off. Little did we know that Ian was going to insist on a warm up going up to the start, spinning and returning to the landing stage before heading off again. Is 22km not long enough already we asked?! After this debacle, and a goodly wait, Anna was set off to chase us down in her single. The first 9km or so went smoothly for all, a little pit stop here and there to replenish fluids, but generally we were all in a comfortable rhythm, the ladies eight maintaining above 3.2m/s and rating 23 easily – until the wind hit. Rounding one corner, the Ouse began to ripple slightly, then a bit more and eventually was completely covered in miniature wind waves. Don’t worry, said Ian, it will be calm round the corner. Keep it long and push through. Ha. Seven kilometres later, still pushing through, the ladies eight were sweating, grunting and generally being rather unladylike. Failure for one of our goals was becoming a possibility as our average speed dropped considerably. I can only assume Suze and Anna were having the same difficulties in their singles. Unfortunately for them, they had no-one but themselves to rely on, and the wind was a constant difficulty trying to blow them into the reeds. For the final six kilometres, the wind dropped and a steady rhythm was found again, taking the boat speed back up to 3.1-3.2m/s for the ladies eight. Suze and Anna also fought through, new plasters on hands and only one (?) accidental stop for Suze in a riverside bush. The last five km known locally as the 5km straight for obvious reasons was the hardest for the two singles due to the lack in change of scenery, making it difficult to feel as if they were progressing. For the ladies eight however, the team spirit of nearly being home and being out of the wind made it one of the easier parts of the race. Once we were joined by the cheering men at 3km to go, moods lifted as did the pace and by 2km left we were back on form. At 1000m, Emily decided we would go for it, so after 21km of slogging through wind and blisters and aches and cramps, much to the amazement of our exhausted bodies, we sprinted to the finish at Ely Boat Club rating 28 in a final flourish. The smiles at the end said it all – thank goodness (being polite) we’ve finished!! Having only broken Sandra’s seat (again) and Gill, we deemed the race a success, and an amazing team achievement. Credit goes to Ian for keeping the crew motivated and together, pushing and supporting us right to the end. Our land crews did a sterling job assisting with boat carrying and de-rigging, during which thanks to Jerry, champagne was drunk and thanks to Mike, Krispy Kreme’s were eaten with no guilt – we had earned them. Then followed the warm down, BBQ, cakes, local beer – Dionysus anyone? and a fabulous chill out by the water comparing war stories of the race and ginormous blisters. The results were in – Anna had set a fantastic time of 1:58:55, taking the WIM2 1x record – a feat she should be very proud of. Suze completed the race in 2:23:10 which was amazing for a first head race in a single – not many would have the temerity to take it on as a first race, and the ladies eight smashed the two hour attempt finishing in 1.47:36, taking the course record for WMasters C 8+ by just under 10 minutes, and beating the record for the WIM3 8+ too. It was an incredible day, one that showed that working as a team could produce amazing results – roll on the Boston marathon!